Celebrities—we want to be just like them. Okay, okay, maybe not just like them, but give us a hint of whatever miracle juice they're drinking (in the form of makeup or skincare) and we'll gladly lap it up like a parched puppy. Especially when said celebrities are part of that extra-special Hollywood set who apparently don't age. The list is extensive, but we're especially enamored with gorgeous peeps like Tracee Ellis Ross, Gabrielle Union, Victoria Beckham, Halle Berry, Jennifer Lopez, Jessica Alba… Need we go on? So we played Nancy Drew to uncover the at-home treatments celebrities over 30 swear by in order to channel their freshest, glowiest, all-around baddest selves. And while we have gleaned a few insider secrets thanks to our relationships with PR, interviews, etc., over the years, most of our findings came with relative ease thanks to good-old Instagram and cyber-stalking. Ahead, see 11 secret beautifying rituals celebrities over 30 swear by—and how you can get on the action at home. 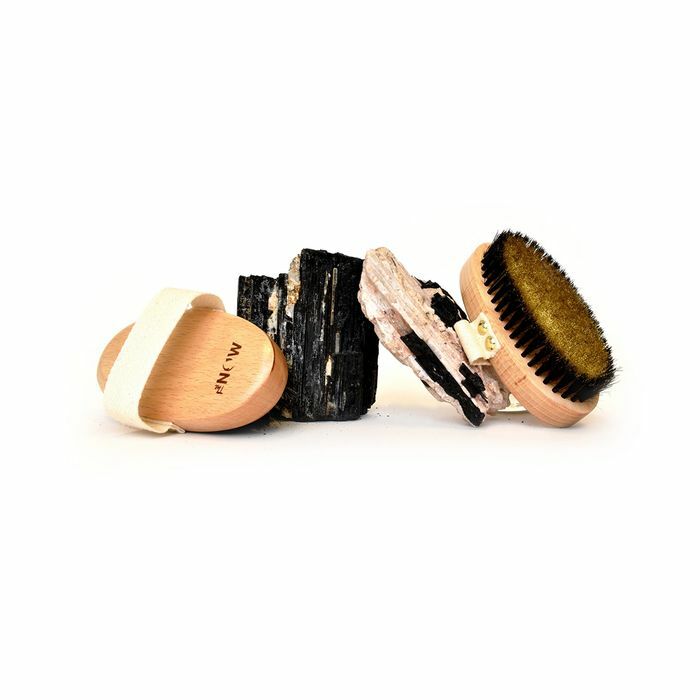 Dry brushing is often hailed as one of the best at-home beauty solves to aid in detoxification, exfoliation, energy supplementation, and all-around glow. (Ahem, we love Allure's on-point comparison that the practice is basically the juice cleanse of the beauty world.) That said, even if it the ritual is seen as a tad hippie-dippy by some, countless celebrities swear by the practice for reducing the appearance of cellulite and sloughing off dead skin cells, increasing circulation. Recently, Ellis Ross declared her love for it, and we instantly become more sold on the idea. Funny how that works, right? To try it at home, you'll a) need a dry brush (we love the one shown above, but they're also available with long handles if you'd prefer), and b) a space and time to do your ritual. According to this guide from Goop, you'll want to dedicate about three to five minutes each morning for brushing, starting at your feet and gradually making your way upward to the heart. Similarly, you'll start at the hands before getting to the rest of your arms, and once you arrive at your stomach, it's recommended to do your brushwork in a clockwise pattern. For more info and a how-to video, check out this helpful post from The Now. Truth be told, we just don't find any celebrity quite as hilarious as Leslie Mann. We're not alone here, right? So you can imagine my glee last summer when I got an inside scoop (via one of our favorite beauty retailers, Violet Grey) on the actress's beauty routine. In collaboration with celebrity makeup artist Jillian Dempsey and VG, Mann filmed a video demonstrating the perfect blush application. (Check it out here.) What was cut from the ultimate video, however, was a quick segment on how Dempsey routinely preps Mann's skin pre–red carpet. Jennifer Garner grabbed a warm, fuzzy hold on our hearts during our blessed first-ever 13 Going on 30 viewing. Since then, she's maintained that hold by way of philanthropy, impromptu visits to In-N-Out alongside the ultimate P.I.C. Ina Garten, and other hilarious Instagram stints via her excellent hashtag, #pretendcookingshow. Jen, we love you. ICYMI, I hate body oil. However, pretty much the only formula that has converted me (or to which I'll at least bend for) is this elixir from organic skincare brand OSEA Malibu. I wrote about the product and how I came to love it here, but in short, it all started with Victoria Beckham touting her adoration for it on Instagram—not paid, pure love! According to her various Instagram posts (via her Beauty Highlight), Beckham loves the oil because it's clean and organic, and her favorite way to apply it is straight onto wet skin post-shower for ultimate glow and hydration. Unlike celebrities, not all of us can get an expensive and time-consuming facial before we slap our makeup on each morning. That said, we stalk their covetable glow with vengeance and are open to any at-home beauty ritual that might grant us a semi-similar result. So when Priyanka Chopra shared her masking-before-makeup ritual with People, our ears perked right on up. "This mask is the first thing that goes on my face before any makeup, and it makes anything I put on after look flawless,” she told the publication. Um, we'll have the same. Olga Lorencin's renowned facials are responsible for some of the most flawless (and ageless) complexions in Hollywood including long-time client Halle Berry. We already knew her Red Carpet Facial is a Hollywood fave pre-event, but her new Ageless version is also a huge hit. Thankfully, Lorencin has done us all a blessing in the skincare department by quite literally boxing up each of her signature facials so we can reap the same sparkly rewards as her A-list clientele but in the comfort of our own home. And below, Berry confirms our suspicion that she uses the Ageless set at home as an insider-approved beauty ritual to achieve her virtually perfect skin. We pretty much kneel at the beauty altar of Rosie Huntington-Whiteley—especially when it comes to any secrets we can glean regarding her perpetually glowing, sun-kissed complexion. And considering how careful she is about exposing her skin to the sun's harmful rays (see IG post below), it felt like a bit of a mystery. Until, that is, we stumbled upon this little nugget of product wisdom via Teen Vogue. Her secret for a flawless and consistently perfect face glow? An overnight tanning mask courtesy of one of our fave celeb tanning artists, James Read. (He once sprayed me, and my self-tanning standards have never been the same.) "James Read's tanning sleep mask is the best facial tanning product I have ever used; I can't stop using it," the model told publication. Noted. According to InStyle, Aniston (alongside many of Hollywood's elite) is a big fan of the microcurrent facial trend wherein an esthetician places electrically charged pads on the face to help stimulate muscles, in turn tightening and toning the skin. Essentially the facial is like a workout for the face, and even though the specialized (and very spendy treatment) is only available at select locations, this handy gadget from NuFace was invented with a similar process and result in mind. FDA-approved, this cute but effective toning device is clinically proven to improve facial contour and uses the same technology Aniston is reaps whilse sitting in her derm's office. (Or at the very least, pretty damn close to it.) Plus, you'll only have to dedicate five minutes a day to your daily at-home tone-up. Honestly, we'd feel pretty darn deceitful using the age-old ''drink more water'' recommendation we've heard over, and over, and over again from literally every celebrity we've ever talked to. That said, celebrities do love wellness bevies like water, but they also enjoy things like green juice and spice-spiked sips. For instance, in addition to her gallon-a-day water habit, Union-Wade has also publicly shared her love of turmeric for its boatload of health and beauty benefits and inflammation-fighting antioxidants. In fact, she told W that her best-kept beauty secret is anything with turmeric. Sure, you can slather it all over your face in the mask-form (we love Dr. Roebuck's Tama Healing Mask, $28! ), but drinking the stuff is perhaps the more potent route. Plus, why not sip while you do all of the other at-home beauty rituals on our list? This chic little powder elixir from The Nue Co. banishes bloat and tummy woes fast thanks to it's all-star (and yummy!) roster of turmeric, cinnamon, ginger root, maqui fruit, and prebiotic inulin. Look, as beauty editors, our ultimate dream would be getting the chance to spend 24 hours as a fly on the wall next to J.Lo's vanity. But since that will likely never happen, we've resorted to investigative ops. Here's the equation we've worked out so far: Dr. Harold Lancer is her go-to derm + she loves cell-sloughing glycolic acid (a tip we picked up courtesy of People) = an at-home beauty ritual featuring the ultimate product marriage of the two! Oh, and in case you weren't convinced, Victoria Beckham also swears by this at-home peel. You're welcome. On the off-chance that you don't have $2300 to blow on celeb esthetician Shani Darden's LED mask of choice from Déese Pro, this newer option from Dr. Dennis Gross will more than suffice. Well-known in the industry and beloved by celebrities like Alba, LED light therapy is often used by experts to gift a wide variety of facial benefits, from the clearing of acne-causing bacteria to the promotion of collagen and elasticity. Darden is famous for using the Hannibal Lector–looking mask on her clients, and we're over the moon that we can still get all the same benefit by using a similar model at home. (For those curious, the $2300 pick is currently sold out at almost every retailer, including Darden's website.) To use this less-expensive version of the celebrity beauty ritual, simply put it on after exfoliation, select your preferred light setting, and use for the programmed treatment time of three minutes; then follow with serum and moisturizer.